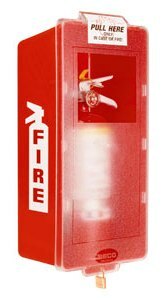 Extinguisher Cabinets are necessary to protect your fire extinguisher from tampering or weather conditions. You might also want to install one simply for aesthetic purposes. Extinguisher cabinets can be made from steel, aluminum, brass, bronze and plastic. Mounting can be surface mounted, or recessed. Extinguisher cabinets come in a vast array of choices and prices.